InSinkErator Replacement Filter. Exclusively designed for the steaming hot water tap system from InSinkErator®, our filters deliver the clean water you demand and represent excellent value. 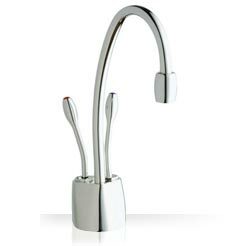 They improve the taste of water by removing or significantly reducing chlorine and other impurities in tap water. The filters also reduce scale and remove solid particles. To ensure that you enjoy a continuous filtered water supply, replacement filters are available in packs of two.